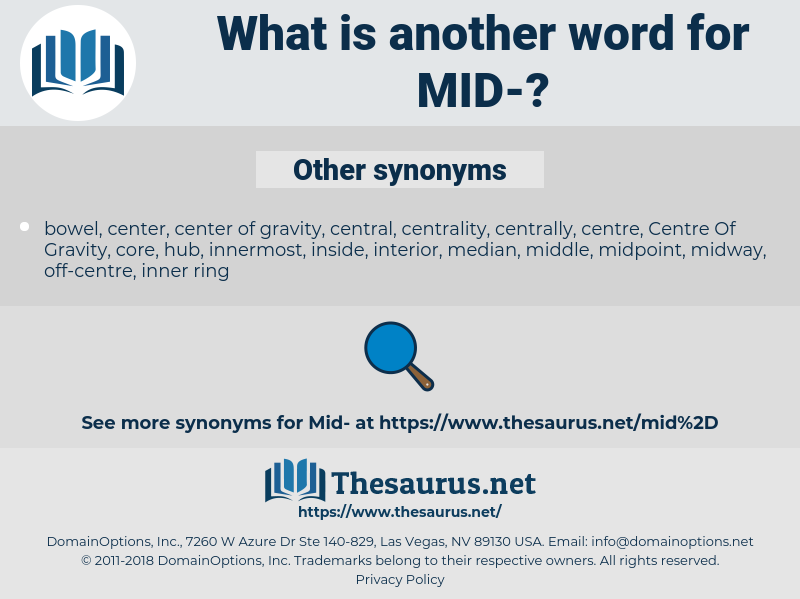 What is another word for mid? Denoting the middle part; as, in mid ocean. intermediate-level, middle-income, environmental, mid-tier, Medium-sized. Strata, midst, midnight, mid-march, milieus, mid-april. mid-year, middle-level, mid-point, intermediate, midterm, mid-2004, mid-2002, mid-term. 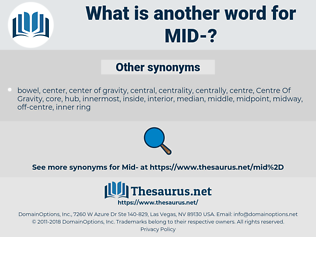 mid-year, mid-1990, mid-september, midpoint, mid-july, mid-2001, mid-point, midday, intermediate, midterm, mid-2004, mid-2000, middleman, mid-term. farthest, furthest, remotest, extreme, outermost, farthermost, furthermost, outmost, early, late, utmost, peripheral, outer. For an instant I hung in mid air. He was close to his grandparents - they had bought his computer for him as a present - but they lived in a tiny Mid - Western town and they simply wouldn't understand either. mated, mande, manta, meat, maund, mahout, manidae, mad, mantidae, muted, med, motet, Mothy, meditate, meadow, manda, medea, minuend, mend, muddy, moot, mammoth, middy, month, mod, maidu, mayweed, mounted, minnewit, meade, Mete, mind, mate, md, made, meed, munda, mutt, mahomet, montia, Mohammad, mott, mete out, madia, manet, man-made, mount, moiety, monument, muhammad, mined, monod, meted out, mutate, minute, matey, minuit, mt, matthew, may day, mound, miniate, menotti, maidhood, mud, mediety, mentha, mite, myoid, mat, maimed, manatee, mennonite, mead, meaty, moneyed, mediated, midi, midway, monet, matai, manat, maenad, manumit, minded, math, manteidae, maid, monday, mimidae, meth, momotidae, moth, mantid, mammutidae, manteodea, monad, manned, monody, mandate, mint, myth, maundy, monnet, method, mediate, minutia, mote, moated, manhood, motto, mountie, minuet, mit, matt, mouth, mayday, mammut, monied, muddied, mantua, mohammed, monte, moody, manhunt, manihot, metadata, matte, mut, Mutawa, moat, meet, mahound, Mahdi, mood, moment, mode, mamet, midday, matted, mitt, mot, momot, mute, MDI, memento.